Japanese metal ware is a fascinating subject area within oriental and asian works of art. A lot of Japanese metal wares that make it to auction are the produce of the highly skilled Japanese sword furniture makers who produced an abundance of tsuba (or hand guards) and menuki (typically bronze metal fittings or ornaments on the tsuka or hilt). Chief amongst these craftsmen were those from the komai family. 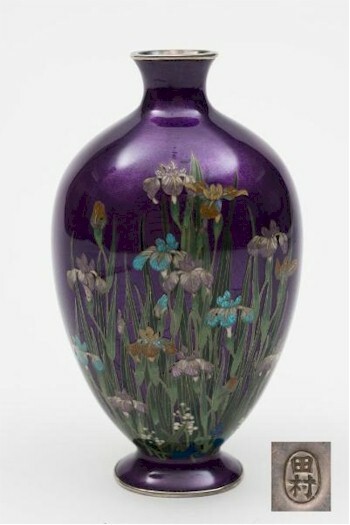 A Japanese Cloisonne Vase (FS27/553). However, the Meiji Restoration in the 1860s led to samurai being banned from carrying swords in 1876 so these skilled metal workers turned their hand to gilded iron, which is also found at auction. 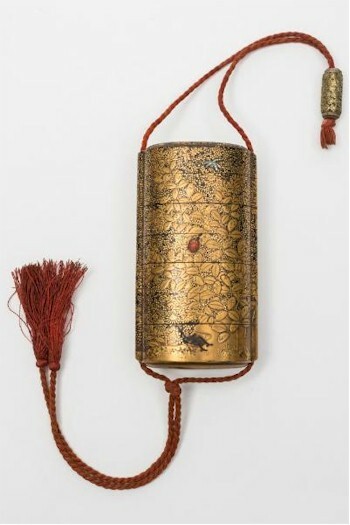 A Japanese Six Section Gilt and Shibayama Decorated Inro (FS27/556). A lot of Japanese metal ware is in the form of bronze okimono or decorative ornaments. They are usually of very simple form and depict deities, warriors, rats or peacocks that had significance in Japanese culture. The better okimono are signed and particularly sought after makers are Miyao and Masaaki.